One in my lap and two close by. Coffee just out of the picture. Ahhhhhh…. 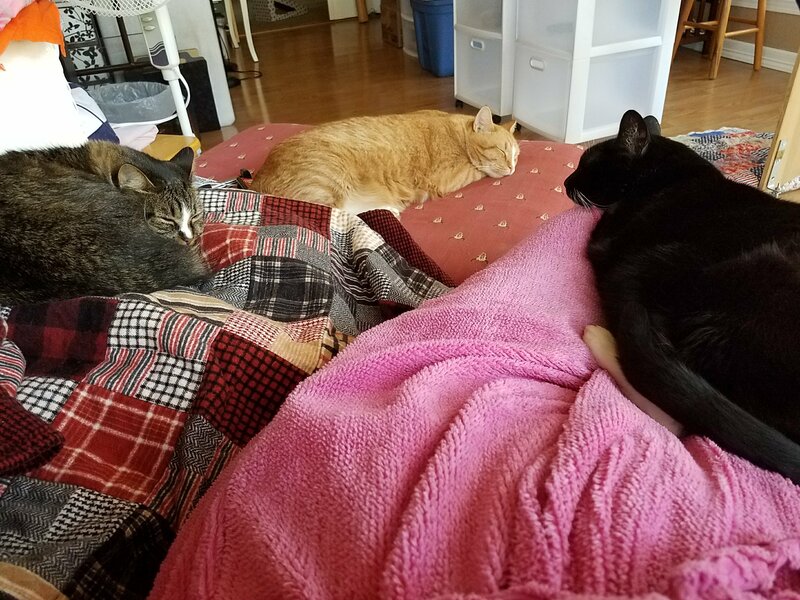 This entry was posted in cats, Panda, Pappy, Pebbles and tagged cats. Bookmark the permalink. Three for breakfast, but only Tiger hung around for the morning. Sweetness! I had two puppies in similar positions yesterday. Temps here have been in the teens and it has been snowing quite a while. I”ll have the John Deere snow blower out this afternoon. I just love your cats and the things they do! It always puts a smile on my face. My Sunday….packing! We are moving to Aurora! Warmth with a small body and a lot of fur, as good as it can get. Isn’t life just wonderful with our 4 legged critters?